Seventy-eight men who have been cleared for release remain in interminable detention. Last week, the attorney Jon Eisenberg was trying to get in touch with a client of his—a Syrian named Jihad Ahmed Mujstafa Diyab, who has been detained at Guantánamo Bay for nearly twelve years without trial. Twice a day for months, medical staff and guards have dragged Diyab from his cell, strapped him in a chair, and forced a tube down his throat, ostensibly to ensure that he doesn’t die during a prolonged hunger strike. The five Guantánamo detainees, reportedly Taliban officials, have now been escorted to Qatar, where they will be able to walk freely on the streets. Left at the military prison are seventy-eight other men who have been cleared for release yet remain in interminable detention. Most, like Diyab, were cleared more than four years ago. Though Obama continues to profess his commitment to closing the prison, and though constraints placed by Congress on his ability to do so have weakened considerably, his administration has not demonstrated the resolve to transfer the remaining prisoners. The most significant complication is “the Yemen problem.” Yemenis make of the bulk of the men who’ve been cleared for release, but none has been repatriated since 2009. Obama announced more than a year ago that he would lift a ban on repatriating Guantánamo’s Yemeni prisoners, a moratorium he himself imposed after a man who’d allegedly trained with an Al Qaeda affiliate in Yemen tried blow up an airplane bound for Detroit using bomb hidden in his underwear. US and Yemeni officials have discussed a plan to move prisoners to a yet-to-be-built detention center outside the capital Sana’a, but the proposal faces funding issues, and there are outstanding questions about whether it would function as a rehabilitation center or merely another prison. Ultimately, the Bergdahl case illustrates that the greatest barriers to closing Guantánamo are political, not legal or logistical, and that they remain in place only so long as the president allows. Republicans who would like to keep Guantánamo open will no doubt channel the right-wing outrage over the release of the five Taliban prisoners to their own ends. But their bluster has no bearing on the president’s authority to send home men whose freedom is both recommended by US officials, and long overdue. 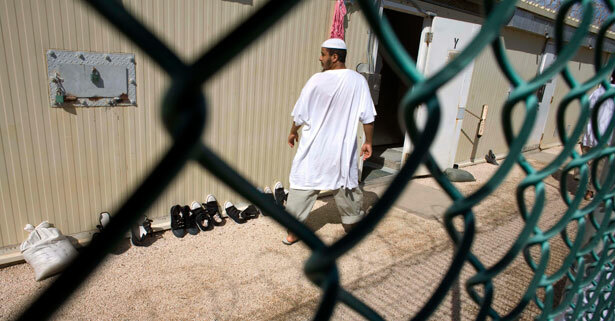 There’s simply no way to close Guantánamo without doing so.